With Christmas and New Year only days away I’m hankering after something special to wear. These gorgeous vintage numbers from Mela Mela Vintage would provide some much needed seasonal cheer. 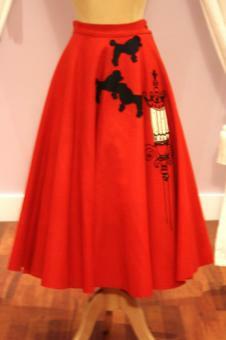 Why not really embrace Christmas and dress as Mrs Claus in this red 1940s suit? It’s smart enough to double up as work-wear afterwards and I bet you won’t find a suit as nice for the price… brand new or vintage. 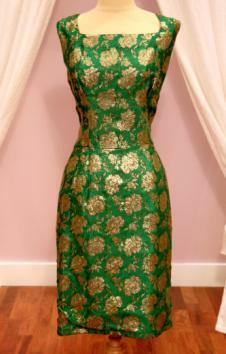 The shape of this festive green and gold 1950s wiggle dress is so classic and so flattering. It would be perfect for seeing in the New Year and best teamed with a glass of matching gold bubbly in one hand. Mela Mela really do vintage well. If like me, you prefer to try before you buy you can visit the lovely Mela Mela ladies at the shop in Teddington, Middlesex. They are very passionate about vintage clothes, their infectious excitement rubs off on everyone who enters the shop and all the customers join in and chat about the clothes so there is a really friendly atmosphere. I challenge you to leave without a smile on your face, whether you make a purchase or not. Just a warning though… you could lose hours looking through their accessories; there’s everything from shoes and hats to lingerie and swimsuits, with trays and trays of gorgeous jewellery in between.